Jamie, Molly, Pinkie and Lauren have been readying the greenhouse for the holidays; here’s a peek at what’s going on. Hope you can come by and see it all in person soon! 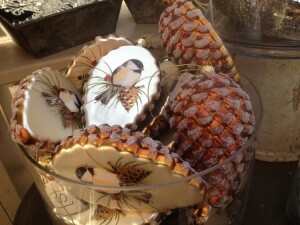 Pretty ornaments abound, along with silver pieces for your mantle, table or to give as a gift. 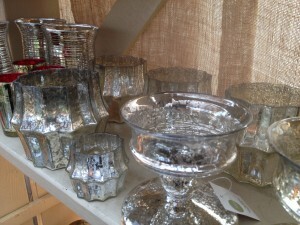 Of course, we’ll have the cut greens, berries, branches and plants for your home, inside and out. 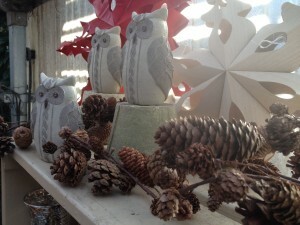 pretty owls and pinecone garland…. 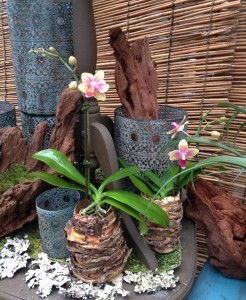 Look also at the wood pieces…they’d be so beautiful on a natural tablescape with miniature orchids or other seasonal flowers. 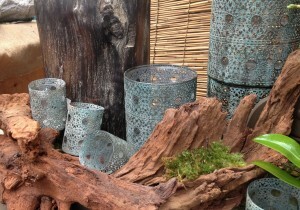 Green lichen mats add even more color and texture to this composition – they are wonderful! I hope you have the opportunity to visit, as the greenhouse is a visual feast for the senses, awash in all the colors and scents of the season…. This entry was posted in Gifts, Holiday and tagged gift items, holiday items, ornaments on November 12, 2013 by Kris Blevons.